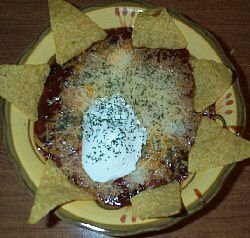 This is a delectable vegetarian chili! Heat oil in heavy large pot over medium-high heat. Add onions, bell peppers, and garlic; sauté until onions soften, about 10 minutes. Mix in chili powder, oregano, cumin, and cayenne; stir 2 minutes. Mix in beans, 1/2 cup reserved bean liquid, and tomato sauce. Bring chili to boil, stirring occasionally. Reduce heat to medium-low and simmer until flavors blend and chili thickens, stirring occasionally, about 15 minutes. Season to taste with salt and pepper. Ladle chili into bowls. Pass chopped cilantro, sour cream, grated cheese, and green onions separately. May also be prepared in a crock pot.